I went in to have a baby last Tuesday, he was born on Wednesday, and then jaundice kept us at the hospital until Sunday. But now we're home and happy. I was trying to explain to Travis' uncle why we were leaving the 4th of July family camp out early so a family of people I've never met before could hang out at our house for a couple of hours. "You only know her from online?" "What will you do if she's weird? Fake labor?" I told him, and the rest of the family who was all listening in by this time, that Kelly wanting to meet me was like having one of the popular girls in high school invite me to sit at her lunch table. Trav's uncle blinked and probably felt bad for Travis and this Kelly woman I was about to host. Travis' cousin said, "We can understand why this would be important for you." Let me tell ya: Kelly was a delight. She was funny and kind and interesting. Her husband was kind and is obviously a good man. Her kids were well behaved, smart, and didn't complain that I had accidentally watered down the lemonade. They didn't complain that we have no toys for older kids - they just made the best and were sweet and kind. So the running theme in Kelly and her family is that they're kind. And to further prove it, they brought me a gift basket full of beer. Good house guests indeed! After a good four years of being carpet-less and unfinished and, ya know, ugly, we finally have thick, lush carpet to comfort our feet on the way to our bedrooms. It turns out that Fry's father was offered a job at Princeton when Mrs. Fry was pregnant with Stephen. Mr. Fry turned the offer down but Stephen has always been wondered what his life would have been like as Steve, a man who grew up in the USA instead of GB. 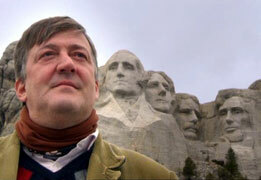 I think Stephen Fry is charming (in the best way), funny, kind, and warm. In the BBC mini-series he travels through all 50 states and samples little bits of American life: coal mining, Ford vs. Chevy, trolleys, plantations, Vegas, the humidity of the south and the freakin' cold of the north. There were several parts that Travis and I especially liked but I think my favorite was his reaction to Truck Nutz. When it works, which it stopped doing at some point yesterday but has begun doing again today. Oh my goodness, love the photo of you and the baby - he is so stinking chubby - I LOVE it!!!! What a sweet baby! I second Colleen. Bloggers meeting in real life make it feel more legitimate. That is what is great about the internet. It can bring about real connections! Love it! I was thinking about you this morning and how happy I was that your delivery was pretty much disaster free and you got yourself a big ol' baby. Hope you are feeling good this week! And for the record, you did start having contractions while I was there...or at least SAID you were having contractions. So you must of had some doubts about me. Your family's response to hosting us cracked me up. I felt like I was sharing a similar story with my family. "Yes, we're making a special stop two hours out of the way to visit a tiny museum and visit with someone I only met online. It'll be great!" Blogger meet ups really are the best! Glad everyone's home and happy. Can't believe both how little and how big your favorite one week old looks! What a fun five favorites post! Your baby is scrumptious, you look amazing, and three cheers for blogger meetups (and cooperative families)! This is awesome. I'm so glad your bloggy meet-up went well. That's very cool. I love blogger meet-ups :) And trying to describe one to your in-laws sounds exactly like how it would go for me too. I actually did laugh out loud at "We can understand why this would be important for you." And, blogger meet-ups are the best. I had some 'splainin to do to a lot of people when Meg came to stay for a while, and when I went to visit Dwij. I mean, these are some back alley ladies...or are they?? You've got such a cutie! Congratulations! !